Devastating forest fires destroyed so much here near my home in the Smoky Mountians last night. I could see the orange glow of flames and smoke through my window as Gatlinburg and Pigeon Forge suffered under a historic and utterly heart-breaking night. I have watched so many friends lose homes and pets and businesses. I've been in tears since yesterday. I have felt so many people's pain. But pain is my inspiration to do what I do best...paint to inspire and bring hope so I painted this painting today. Life has a lot of extremely scary fires, and we question why God won't just send us even a little rain. We don't realize at the time that fires nourish the ground with nutrients, revitalize the ecosystem, and kill off the old growth to make way for the new. The forest will be so much more beautiful than it ever was before once spring brings new life after the fire. 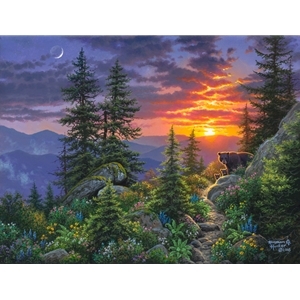 This painting is a trail in Great Smoky Mountains National Park. The friendly momma bear and her cubs are taking a morning walk to enjoy the new glorious life that has blossomed out of the charred remains of their home. They made it through the winter, and now life has a new beginning. My friends, we will make it through this. This is just the master plan to make everything even more beautiful. Weeping endured for a night, but joy comes with the dawn!